Joey Logano secured his spot in the NASCAR Playoffs’ Championship 4 when he held off Martin Truex Jr. in a frantic final lap and took the checkered flag in the First Data 500 at Martinsville Speedway on Sunday. Logano’s first career Monster Energy Series win in Martinsville came on a dominant day when he led a race-high 309 laps. 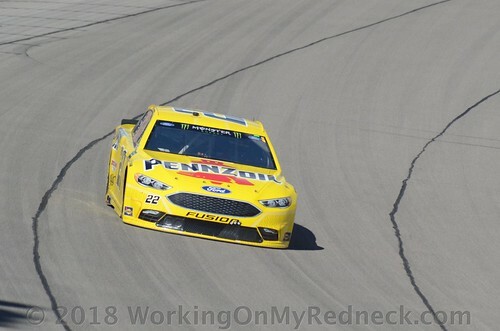 Logano had taken the lead for what appeared the final time for good off pit road on Lap 460 of 500, starting from the top spot after his No. 22 Team Penske pit crew helped him off pit road first. But Truex fought his way back to the front after starting at the rear when his No. 78 Furniture Row Racing Toyota failed pre-race inspection. Truex finally drove his way to the front and battled with Logano for the last 30 laps. For the last six laps, those two were door handle to door handle battling for the lead. Truex cleanly took the lead with one lap remaining. Logano got back to Truex’s bumper going into turn three on the last lap and dropped kicked Truex coming out of four heading to the checkered flag. As they crossed the finish line with their motors on the rev limiter, it was Logano narrowly in the lead for the win. Is there a payback coming back to Logano? In other words, is Logano “flirting with disaster”? Denny Hamlin managed to sneak past Truex to finish second. Truex, who now has not won in 78 starts on short tracks, finished third. Kyle Busch and Brad Keselowski rounded out the top five. Joey Logano had three players stowed away riding shotgun this week. Those three players rooting on “Sliced Bread” include Karen The Highly Opinionated Southern Belle, Linda B. The Cookie Mom, as well as Ol Skid-Marc. All three picked up a really cool 59 points to add to their 3rd segment totals. Following the three players who were riding with the race winner, the second biggest scorer of the week is David The Mudslinging Throttle Jockey. The Throttle Jockey racked up a nifty 56 points for Denny Hamlin’s second-place finish. Also fairing very well this week is Lonna The Quilt Angel, Bobby Blue Crush, as well as Amber The Extremely Lucky Cheddar Head. This unlikely and very motley crew were riding tall with Kyle Busch and for their support received a much-needed score of 49 points. Meanwhile, Linda R. The Lemonade Lefty was jumping up and down with excitement when Chase Elliott rolled across the finish line in 7th place gathering up 34 points for the afternoon. Rounding out the top five scorers this week is Carlton The Doorman, Bernie The Bay Area Bandit, as well as Dan The Numbers Cruncher. These characters had all of her marbles in the marble sack of “Blazingly Bad” Brad Keselowski and were rewarded 33 points. Only four players, Snoopy Dawn, Jim, aka Chiefy, Jeremy The Coach, and Edie The Las Vegas Super Star remained in their previous resting spots. The remaining eighteen players, however, all changed zip codes this week! The largest mover of the week is Jerry The Buschwacker. The Buschwacker had a terrible race, scoring only 1 point, dropping him like a bad habit eight (8) places to sit now in 10th place. Having a very race at Martinsville is Linda B. The Cookie Mom stepping up five (5) positions to sit in 13th place at the end of the day. Likewise, David The Mudslinging Throttle Jockey has had a change of fortune climbing up four (4) places to be back in the money sitting in 2nd place this week. This next quartet of players, Amber The Extremely Lucky Cheddar Head, Karen The Highly Opinionated Southern Belle, Ol Skid-Marc, and well as Kathy The Church Forecloser had a very mixed result when the checkered flag waved. The Cheddar Head, The Highly Opinionated One, and Ol Skidz stepped up their game and stepped up their place of residence three (3) places this week to 7th, 12th, and 19th, respectively. Conversely, The Church Forecloser dropped like a bad habit three spots to sit now in 20th position. Six players moved two (2) positions at the end of the Martinsville race. Those six players include Kilimanjaro Bobby, A&M Aggie Sue, Linda R. The Lemonade Lefty, Carole, aka Rudy, Lonna The Quilt Angel, Doug The Gandy Candy Man, and Zee, aka Sissy. Kilimanjaro Bobby and The Quilt Angel moved up two places to sit in 8th and 17th, respectively. Meanwhile, Aggie Sue, The Lemonade Lefty, Rudy, and Sissy all dropped two places to sit in 1th, 14th, 15th, 16th, and 22nd, respectively. This week “The Crappiest Pick of The Week” goes to Jerry The Buschwacker who could only manage to add just one (1) point to his totals this week. We have a new Princess of The Poophouse this week! Sissy has evicted The Las Vegas Super Star this week and has taken over sole control of “The Outhouse”. Check out the results of the First Data 500 at Martinsville. Editor’s Note: In light of Joey Logano’s drop kick of Martin Truex, Jr. at Martinsville, I believe that Logano is now “flirtin’ with disaster”!